Description : Swiss made Quartz movement. Stainless steel case. 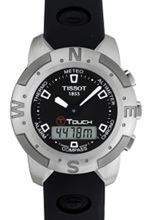 Functions: Hours, Minutes, Seconds, Day, Meteo, Altimeter, Chronograph, Compass, Alarm and Thermo. Tactile scratch resistant sapphire crystal with non-reflective coating. Anti-magnetic case with rotating bezel. Water-resistant to 30m/100ft.